What Made Me Think of This Story? Something about this time of year makes me really eager for warmer weather and the antique events that accompany it. Nobody has auctions outside this time of year. I am not eager to sit in my cold car waiting for an estate sale to open. There are no outside markets or sales venues--so what is left? A midwinter antique show or two. This past weekend--Husbola and I were set up at an antique show--and as is always the case--there are ebbs and flows in the crowd and sales. It was during one of these ebbs that I started thinking about my antiquing beginnings--and one particular event--about 40 years ago. Antique auctions were a several times a summer past time while vacationing as a child in central Wisconsin. My Grandma in particular loved to go to a good farm auction--and she would buy things to use in the cottage--she was not selling them on. 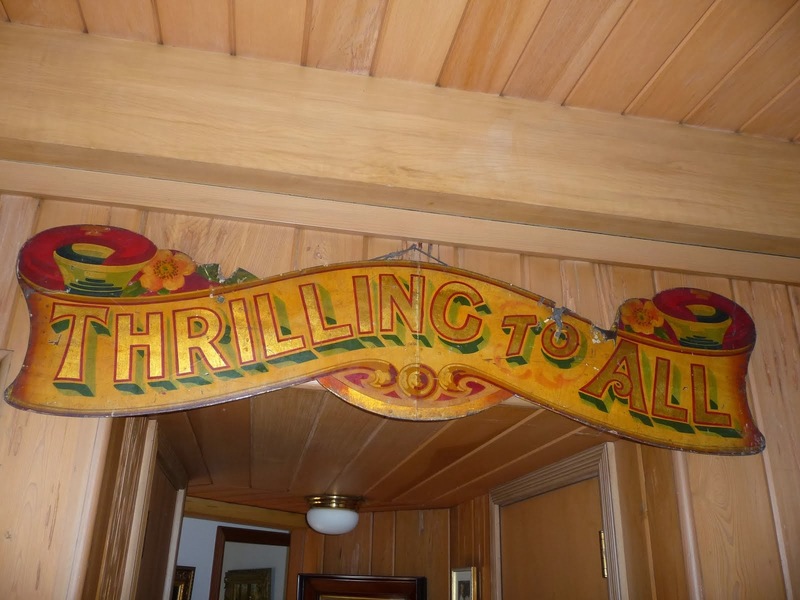 One particular August, several family members and I attended a huge estate auction. One of those auctions that I would give my eye teeth to freeze in time and attend that same auction today. The treasures that were not evident to a young 11 year old--that would be candy to this 51 year old today. I remember seeing a huge mayonnaise jar filled to the brim with marbles. Grandma bid on that jar for me--but it went too high for her at 5 dollars. So instead--I got a huge mayonnaise jar of crayons. I think it was a dollar. My grandma and mother were both interested in a singer treadle sewing machine. It was a fabulous example in a wooden case--and the machine was beautifully painted and it was a in super condition. In addition--this was when the craze of copper wash boilers and milk cans were also big--there was one of each of those. So we all waited patiently for these items of interest to come up for bid. All of a sudden--there was a huge crash on the street next to the farm yard. Many people started running to the road to see what the commotion was. A woman's car had run out of control and crashed headlong into a parked car. My dad was one of the people who ran to the noise to see what had happened. Just as quickly he was running back to us to inform us that the car that was "run into" was ours. OH NO!! said we women as we all ran to the car to survey the damage. Now what? How will we get home? How will dad be able to get back to the city to his job tomorrow? Do they even have tow trucks in this part of the country? "Wait," says Grandma. "Is the auction still going on? "All the crowd is down here, looking at your Daddy's car," she added. "There is no one up there to bid--quick--let's GO!" Grandma grabbed me and grabbed my mother--and off we ran --AWAY from the wreck, back to the auction site. I bet you can figure out the rest of the story. Copper wash tub--$3.00. Milk Can-$1.00. Sewing Machine-$6.00. Car repairs? Who knows. It was a great day. For many years, Husbola and I have attended this show as customers not dealers. It is held in February--at the perfect time for antique lovers and decorators to start getting serious cabin fever. Christmas is way back in the rear view mirror--any thought of serious spring is not even in focus yet--but most people are ready to be seeing fresh merchandise and start the spring summer cycle of the antique hunt. The show is held at the Forest Hills Lodge Feb. 19-20--which is north of Rockford and on Hwy 173. It now is very accessible as there is an exit off I-90/39. The show is the perfect size--with 40 or so dealers--and I am happy to say that we are one of them this year. Shows are changing and disappearing at a very rapid pace these days. We have had to edit out a few shows in the past few years. The customer base is changing--tastes are changing-discretionary income has changed--and it seema that shows and show management is frequently too slow in adapting. The NIADA show is more than 50 years old. Over the years that we have attended--there is some turn over in dealers--but there always seems to be a good balance of furniture-smalls-quirky-traditional-career dealers and fresh faces. We have been taking time and care in planning our booth--We like to present a very fresh, new to market look. We want to put out new finds and items we have bought especially for the show--not stale merchandise that we refer to as "old friends." This show brings out a large crowd--"like the good old days" of shows in the 1980s and 90s--remember--I think it is the cabin fever thing and the good mix of stock. It is not a "snobby" show--and one that is popular with the public and dealers alike. Maybe as you feel the weekends roll around these days--you have this agitation that you just can't put your finger on. That discomfort that a trip to a shopping mall or movie theater just won't remove. Trust me--try a mid winter antiques show--it is a cure for many ills. I think the medical Black Cloud has finally passed over Lady Antique Dealer's house--and we are looking forward to a good and profitable 2011 with no more medical nonsense.. Another delay in this blog writing was due to a week in the hospital and the return home without a very dreadful gall bladder. So now we are readying ourselves to get installed in our next antique adventure--a new booth at the Odana Antique Mall in Madison Wisconsin. We had been on a waiting list for sometime--but space does not open often at this shop. If you visit it--you will know why--it simply is the best shop you will see in Wisconsin--and maybe a much wider area than that. It is housed in a former furniture store--and has excellent lighting. The owner and management are commited to presenting a good shop--they care about the shop--what it looks like--and the booths must be tended and freshened regularly. I have yet to find a dusty stale booth. In this economic climate--dusty and stale sits and does not sell. Period. Now Husbola and I have loaded the truck with treasures--well priced we hope. When you are in a large good quality shop--price point and condition are most important. There is good competition from other dealers. We like that--it keeps us on our toes to find good items--and we don't become complacent and just let our stuff sit and rot in our space. We will try a little bit of this and a little bit of that. Some furniture-paintings-small decorative items. Our space is small--and we will not overstuff it. Haven't you been in a shop that is so stuffed you cannot see individual things and your eyes glaze over with disinterest? Husbola and I try something new each year-to keep our business fresh. We look forward to 2011--a couple new shows and a fresh shop to try. We are even throwing in a trip to the UK--and might pick up a treasure or two. We promise our customers some interesting and fresh to market decorative items--and much more regular blog postings!